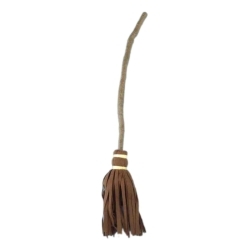 This crooked broom can be used with any witch costume for both children and adults or as a prop for a costume from Harry Potter. It can be used by directors as a broom for the Wicked Witch in “The Wizard of Oz” or for Cinderella. The Crooked broom measures 32” long and has a soft felt brush.